Century Cycles Blog: Talking Head on Parking Bikes; Or, if David Byrne lived in Cleveland, where would we put his racks?? Talking Head on Parking Bikes; Or, if David Byrne lived in Cleveland, where would we put his racks?? Former Talking Head David Byrne is a huge bicycling advocate in his hometown of New York City. For his latest project, he collaborated with an art gallery and the transportation department to design nine bike racks that are scattered throughout the city. 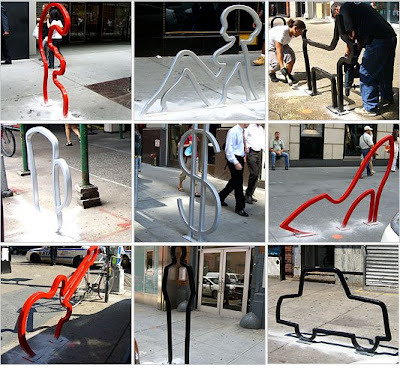 They look pretty cool but are perhaps too un-rack-like -- some have been noticeably devoid of bikes and one theory is people think they're more "art" than "parking." Boo. Hoo. New Yorkers don't know how good they have it. If the hipsters in Brooklyn don't want their Byrne bike racks, we'll take 'em! I'd put one outside the Liquid Planet at Crocker Park, to make getting an oatmeal smoothie fix a little easier. So if you could pick a place in northeast Ohio to put a Byrne bike rack -- a place you ride to that is sorely in need of bike parking -- where would it be? ?